New York City hotels are fighting a tiny menace that makes life miserable for guests. Bed bugs have packed their bags and moved in to some of the top hotels in the city. 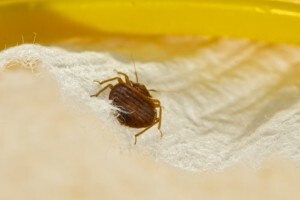 The tiny bloodsuckers infiltrate bedding, walls, drawers, curtains, suitcases, tote bags, clothing, or anything else they can attach themselves to for a free ride to a new destination. Upon arrival the bed bugs set up housekeeping, then wait for the food buffet – which is the guests – to arrive. Bed bugs can bite multiple times leaving red, itchy welts. While not disease carriers, some people do have an allergic reaction. According to a report from the Bedbug Registry, New York has experienced an increase in bed bug complaints of over 44 percent in two years. This is alarming as the hotels used for the report are members of the Hotel Association of New York City. Out of 272 association members, a whopping 65 percent had received at least one bed bug complaint. Another 18 hotels had a total of 363 bug complaints which equals 42 percent. NYC bed bug control is at the top of the list for members of the association and to fight the insects, they have implemented anti-bedbug programs. Whether you have a rental property, home, or business, consider NYC bed bug control for your property. Contact Stern Environmental Group for an inspection and treatment by our experienced staff. Hearing the words “bed bug” is one thing, finding them in your home can ruin a perfectly good day. For such tiny pests, bed bugs can dig in their heels and pack a big wallop in upsetting your cozy home environment. An infestation of bed bugs is tantamount to having an army running rampant through your home. These wingless pests are night predators and prefer the taste of human blood as their main course. Bed bugs are found in many places in the home, office, restaurants, summer camps, theaters, schools, and hotels, just to name a few. The infiltration of these biting/itching pests requires treatment using extermination techniques and specialized products. Early detection is key in addressing these gargantuan – only in aggravation – bugs. Using the services of the Stern Environmental Group puts you, your home, and your family in qualified hands to eradicate these tiny home wreckers. Sheets, quilts, sofa throws and chair covers may show evidence of bed bugs due to rusty spots left by bugs. White clusters with anywhere of 200 to 500 eggs the size of a pea may also be found on material and linens. Bed bugs give off a distinct odor. If you wake up with red itching welts or sores, have your home inspected. Contact us by phone, send us an email, or use our convenient online form if you need help with a residential bed bug issue. The start of every school year brings a rash of reports that bed bugs have been found crawling on students’ backpacks or across classroom floors. Teachers trained to be on the lookout for these blood-sucking insects and fast action by school districts when bed bugs are discovered often prevents full-blown infestations at school. But it’s a different story when children inadvertently bring bed bugs home in their backpacks. Educate yourself about bed bugs and their behavior. Know what to look for. You’ll find helpful information and photos of bed bugs and their bites on the Stern Environmental website. Inspect your child’s backpack, lunch box and coat when he gets home. Do not let your children take items that travel back and forth to school to their bedrooms. Purchase a large plastic tub with a tight-fitting lid for each child and keep it near the door for storing book bags, coats and other school items. Keep an eye out for bed bug signs. If you suspect bed bugs, call Stern Environmental immediately for professional bed bug extermination. Have a college student? Read our bed bug tips for college students. Are Bed Bugs Coming Home with Your Child’s Homework? Teachers are excited to welcome children back to school in the fall, but the pests that sometimes hitch a ride to school on students or their backpacks have cast an unpleasant pall on the start of the school year. Teachers and students have gotten used to the weekly head lice checks and lectures about hat sharing. But the resurgence of bed bugs has added an unwelcome tension to the start of the school year and made teachers — and students — hyper aware of creepy crawlies in their classrooms. Because bed bugs are not known to transmit disease, they are classified as nuisance pests. But these tiny insects invoke a huge creep factor. Largely nocturnal, bed bugs creep into their human victims’ beds at night to feed on their blood. Unlike head lice, bed bugs do not live on the human body. Between meals they crawl away to hide in nearby cracks and crevices. Bed bugs are adept hitchhikers and frequently arrive in schools hidden in the backpacks or clothing of children who live in infested homes. A bed bug sighting can induce panic as it did at Newark High School in Ohio recently when bed bugs were spotted crawling on a student’s backpack. Students were phoning their parents in panic and more than 100 worried parents pulled their children from classes.